The multivariate normal distribution is a generalization of the univariate normal distribution to two or more variables. It is a distribution for random vectors of correlated variables, where each vector element has a univariate normal distribution. In the simplest case, no correlation exists among variables, and elements of the vectors are independent univariate normal random variables. Because it is easy to work with, the multivariate normal distribution is often used as a model for multivariate data. 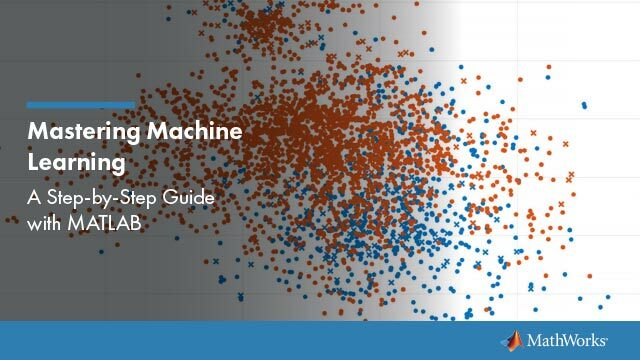 Statistics and Machine Learning Toolbox™ provides several functionalities related to the multivariate normal distribution. Generate random numbers from the distribution using mvnrnd. Evaluate the probability density function (pdf) at specific values using mvnpdf. Evaluate the cumulative distribution function (cdf) at specific values using mvncdf. The multivariate normal distribution uses the parameters in this table. Note that in the one-dimensional case, Σ is the variance, not the standard deviation. For more information on the parameters of the univariate normal distribution, see Parameters. where x and μ are 1-by-d vectors and Σ is a d-by-d symmetric, positive definite matrix. Supports singular Σ for random vector generation only. The pdf cannot be written in the same form when Σ is singular. Uses x and μ oriented as row vectors rather than column vectors. For an example, see Bivariate Normal Distribution pdf. Although the multivariate normal cdf has no closed form, mvncdf can compute cdf values numerically. For an example, see Bivariate Normal Distribution cdf. 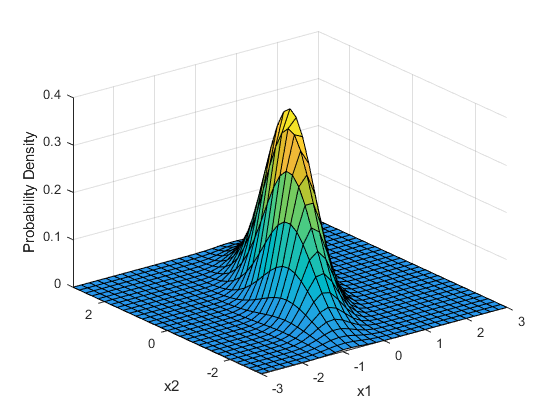 Compute and plot the pdf of a bivariate normal distribution with parameters mu = [0 0] and sigma = [0.25 0.3; 0.3 1]. Define the parameters mu and sigma. Create a grid of evenly spaced points in two-dimensional space. Evaluate the pdf of the normal distribution at the grid points. 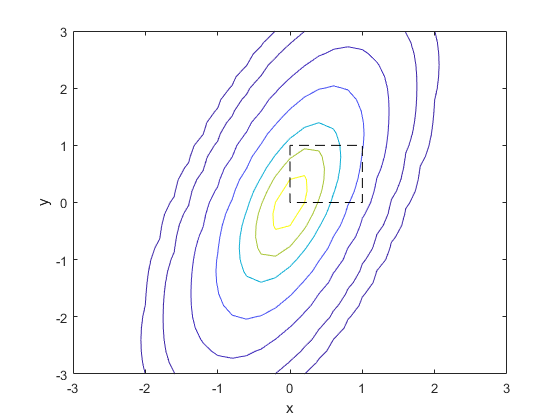 Compute and plot the cdf of a bivariate normal distribution. Define the mean vector mu and the covariance matrix sigma. Create a grid of 625 evenly spaced points in two-dimensional space. Evaluate the cdf of the normal distribution at the grid points. 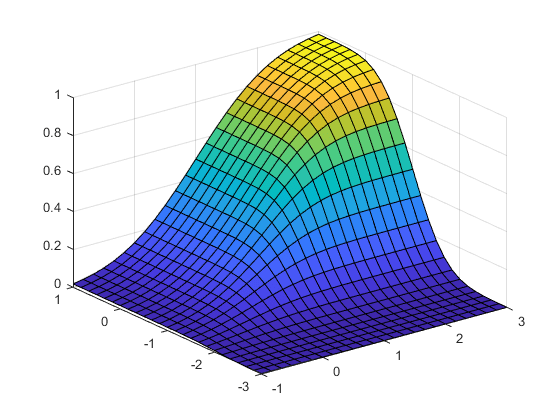 Compute the probability over the unit square of a bivariate normal distribution, and create a contour plot of the results. Define the bivariate normal distribution parameters mu and sigma. Compute the probability over the unit square. To visualize the result, first create a grid of evenly spaced points in two-dimensional space. Then, evaluate the pdf of the normal distribution at the grid points. Finally, create a contour plot of the multivariate normal distribution that includes the unit square. Computing a multivariate cumulative probability requires significantly more work than computing a univariate probability. By default, the mvncdf function computes values to less than full machine precision, and returns an estimate of the error as an optional second output. View the error estimate in this case. Kotz, S., N. Balakrishnan, and N. L. Johnson. Continuous Multivariate Distributions: Volume 1: Models and Applications. 2nd ed. New York: John Wiley & Sons, Inc., 2000.